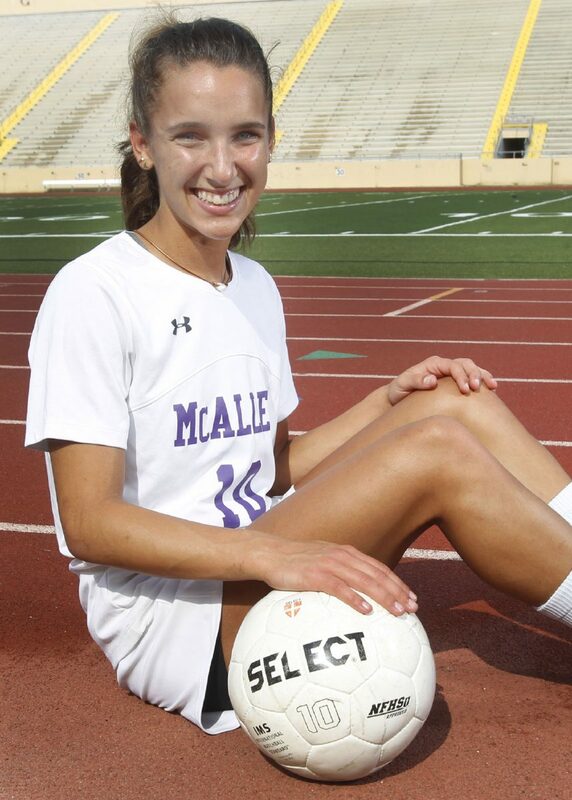 At the end of her freshman season at McAllen High, Anna Hover decided the best option for her soccer career was to move to Oklahoma. She said it was tough to leave her friends and family, but the change of scenery offered her more exposure and a chance to sharpen her game against different types of athletes. Playing for the Tulsa Soccer Club of the Elite Clubs National League, Hover squared off with top players from across the nation. After two years, she felt she had accomplished what she set out to do, so Hover decided it was time to come back home to McAllen for one last run alongside the players she grew up with. Hover was nothing short of dominant in her return to McAllen High, scoring more goals than any Valley girls soccer player before her with 65. Her effort led the Lady Bulldogs to one of the best seasons in program history — a 29-3-1 mark and a trip to the Class 6A regional semifinals — and earned her The Monitor’s All-Area Player of the Year honors. Hover had her eye on the goal-scoring record from the start of the season, chasing the mark of 52 set in 2000 by McHi’s Mary Martinez. She eclipsed that pace with ease, even without playing during the second half of most games as McAllen High opened up huge leads on nearly every opponent. Hover played central midfield as a freshman at McAllen High, but during her time in Oklahoma she said she “evolved” as a player, becoming a scoring threat at forward. Though Hover’s gaudy goal total jumps off the page, Arney said she’s just as potent as a distributor, especially given her dribbling prowess and ability to change directions. Given Hover’s ability to control the flow of play, Arney said McHi’s game plan was sometimes to simply “Let her play.” Hover became a leader, which she said was a substantial shift from her role in Oklahoma. She wasn’t always vocal, but her work ethic was infectious. Arney said Hover found success in that role because of her maturity — the biggest difference he can see in her from freshman year to now. During her first season, she would balk at strength and conditioning work, instead wanting to practice her skills on the field. That outlook changed completely this year. For Hover, the goal dating back to freshman year has always been Division I college soccer. Arney saw her drive to reach that level amplify tenfold upon her return to McHi this season. During offseason workouts, coaches told Arney that Hover was a “beast” in the weight room. He called her a “piece of iron” — very strong and exceptionally fast. Her efforts all paid off in February, when Hover decided to stay home again, signing a letter of intent to continue her college career at UTRGV.